We may not want to admit it, but Google owns the Internet! Well it may not legally own the Internet, but just about everything we do online somehow touches Google. Google has created a number of places where businesses can promote themselves. These listings are tied directly to every online search done through Google and every mobile search done from a smartphone. It is estimated that 97% of consumers search for local businesses online. Be there when they’re looking for you with Google+ Local for business – a free local platform from Google. Google+ Local is the new ‘Yellow Pages’ and it’s important that you have a high profile listing for your business. Blue Eye Group will verify your exiting listings with Google and if they don’t exist, we will create them correctly for you. 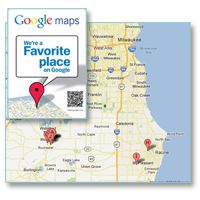 For more information on our Google+ Local and Google Maps Consulting services, please call 262-662-9667 or fill out the form below.